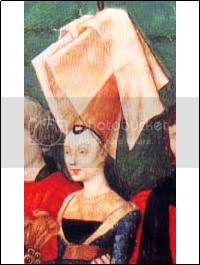 Louise of Montelimar ("Louise the Blessed"') (1324 - 1377) was the first wife of King Edvard II of Arendaal and thus the Queen Consort of Arendaal and Queen Consort of Suionia between 1350 and her death in 1377. The daughter of Charles VII of Montelimar, she married the future Aren King seven years before he ascended the throne. 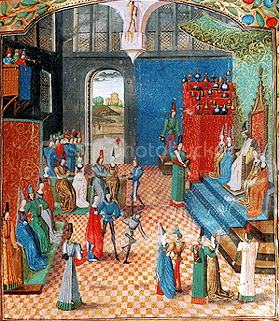 The marriage of Edvard II and Louise took place in 1343, seven years before he became King. The event has been documented extensively by contemporary chroniclers. The bride was 19 and the groom three years her junior. The writer Robert of Clari is clear about the rich entourage that accompanied Louise to Emyn Arnen: "Her royal father arrayed his daughter very richly and sent her with the messengers to the Aren kingdom ... When they were come, her husband the Prince did very great honor to the damsel and made great rejoicing over her and her people ...". Louise's eldest son by Edvard, Crown Prince Lief predeceased her husband and so Edvard II was succeeded by their granddaughter Blanche I. Though grief stricken by Louise's death, King Edvard II would go on to remarry, taking the Batavian Princess, Catharina as his second wife in 1378. The latter surprised and delighted the Aren court by naming her daughter by Edvard II “Lovisa” (an Aren form of the French name Louise) in honour of Queen Louise. Perhaps because she was preoccupied with her many pregnancies, Louise's political influence as Queen was muted. She presided over Edvard II's court and was seen as the pinnacle of the medieval lady: demure, elegant and beautiful. She is characterized in the Historia Norselandt as prudent, modest, and with good sense. 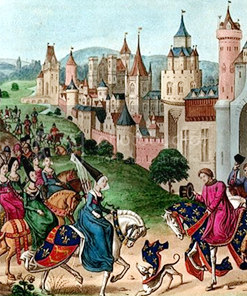 The queen was fond of jousting tournaments and court masques. She was also a patron of literature, including Andreas Capellanus, who served in her court, and Chrétien de Troyes. Louise was literate in French, Norse (Arnen) and Latin and maintained a substantial library. She was also commended by the Church for her piety and generous donations to religious institutions.